Norwegian Forest Cats are bigger than most cats and enjoy being around people, hence their popularity in Europe. 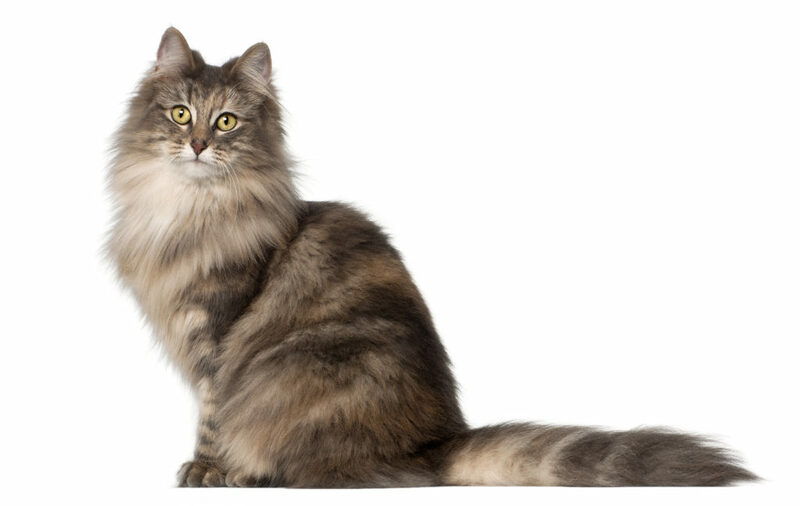 Whether you adopt a male or female Norwegian Forest Cat ultimately depends on your personal preferences, and more likely will be decided by the particular cat you happen to fall in love with regardless of their gender. In other words, our cats often choose us and not the other way around! That said, there are actually some subtle differences between male and female Wegies, both in physical characteristics and personality. The male Wegie is generally bigger than the female, weighing between 12 and 17 pounds (while the female weighs around 10 to 13 pounds). He is suitable for any home–especially with people who can regularly brush out his dense fur (which sheds frequently). He is a climber, and it is essential to buy a ceiling-height cat tree and keep it near his domain. Mr. Wegie appreciates human company but does not constantly demand attention like other breeds. He is intelligent, independent and usually gets along easily with dogs and other cats. He is loving, kind and gentle and has a strong nurturing instinct. As mentioned, Ms. Wegie is a little smaller than her male counterpart. She regulates her appetite, increases exercise and reduces food intake when she feels necessary. Therefore, she usually does not need a special nutrition plan when provided with sufficient space to roam and run. Like Mr. Wegie, she ought to be groomed daily to avoid knots and tangles in her coat, especially during shedding seasons. Ms. Wegie is a loving, sweet cat and enjoys interacting with her humans. She bonds quickly with her family once she feels she has been accepted. She enjoys praise and makes a loving companion. She is a hunter at heart and chases toys in the room as if they were real prey. Many Norwegian Forest Cat owners will tell you that the male Wegies tend to be a bit more loving while the females are more playful, but honestly I haven’t seen that clear of a distinction. Like all cats, each one is a unique individual with their own personalities. If you would enjoy having a big, beautiful, friendly kitty roaming your house, a male or female Wegie will be a perfect addition to your family.